The oneworld lounge at Los Angeles (LAX) Tom Bradley International Terminal (TBIT) has not changed much since it opened in 2007. The most noticeable change over the years was the re-arrangement of the dining area. Since my last trip report on this lounge (note not since my last visit), they have replaced the individual dining tables with a long table. Wines and champagnes are also now placed on the table instead of the buffet counter. 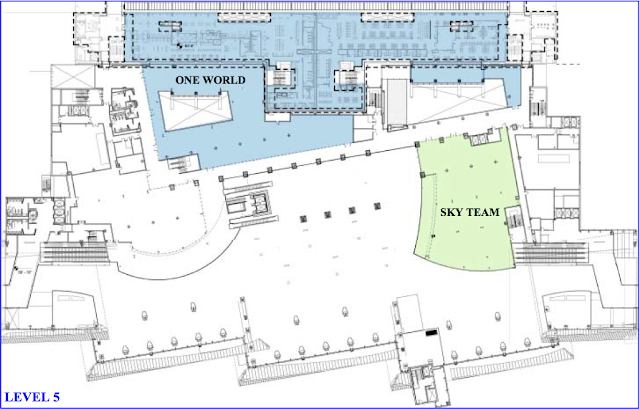 5th level floor plan of the new TBIT. Image by LAWA. But more changes are definitely coming to the LAX oneworld lounge pretty soon as the TBIT is undergoing its modernization and expansion project right now. According to the plan released by LAWA, oneworld will take over the existing Star Alliance Lounge and part of the new Bradley West building and will have the largest lounge at TBIT. 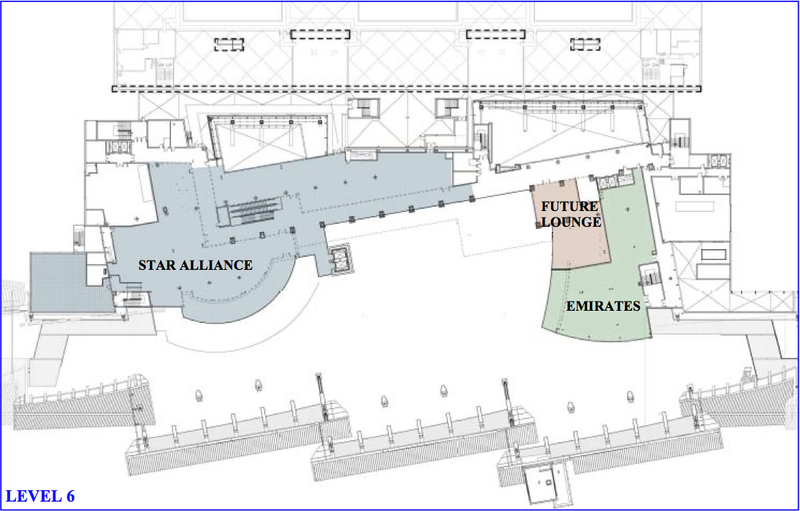 Assuming no further delay, the new lounge will be opened in stages - first with the new Business Class lounge some time this summer, followed by the new First Class lounge in early 2004. So this will probably be my last time visiting the current oneworld Business Class Lounge at LAX. Other than the buffet (which I will cover in the next installment of this trip report series), there is an open bar with 5 TV mounted on the wall, all on different channels with sub-titles on (no audio for the obvious reason). Also, iMacs are provided in a internet bar like set up. I haven't really used them as I usually carry my own laptop with me. The wi-fi used to be spotty but it seems to be fine today. It is password protected and you have to get the credential at the reception desk. Note that everyone is using the same password so the password is only for preventing the non-oneworld lounge guests from accessing the network, not really for other security purpose. You should take extra steps, e.g. using a commercial product like Norton Hotspot Privacy or connecting to your own VPN network, to protect your data if it is important. Unlike the JAL First Class Lounge and Sakura Lounge at New York JFK, the oneworld Lounge at TBIT have plenty of shower facilities. Although these shower rooms are shared between the First Class and Business Class lounges, I have never had problems getting a room before. Simply show your boarding pass to the attendant to reserve a room. If you need extra amenities such as toothbrush and toothpaste, you can get them from the attendant as well. The individual rooms aren't locked when it's vacant (but they locked the entrance to the facilities though), so you don't need a key. 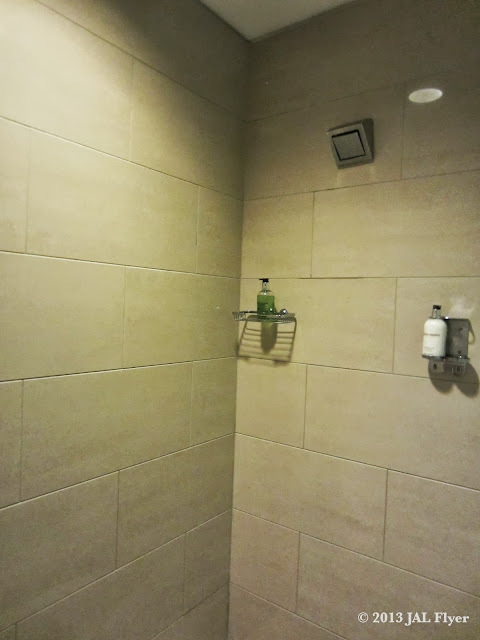 The shower room had some very basic amenities such as body soap, shampoo, hand wash, and lotion. All these are from Molton Brown London. There was also hair dryer and towels. One extra item I don't usually see in that many lounges is the disposal box for medical needles which is a nice touch. How did I know they were mostly CX passengers? Because you could see empty seats everywhere after the CX boarding announcements were called. CX isn't as efficient as JAL when it comes to boarding and there's a bigger gap between the two boarding announcements than that between the departure times. The lounge was so much nicer when it's not full. Usually I would avoid the day when CX operates its afternoon flight to Hong Kong. But it is not possible anymore since CX has increased the frequency to daily once again. I could only imagine how crowded the lounge would be at around midnight when there are multiple CX and Qantas (QF) flights departing at around the same time. Definitely looking forward to the new and more importantly bigger lounge opening later this year. Another thing I hope oneworld would change is the temperature at the dining area. Probably due to all the hot plates, you will be sweating simply by sitting there! It's fine if you take a shower after the meal, but definitely not ideal if you are running late and shower isn't possible.